Ok, i think i got that, so they really are very apically dominant then? I thought this was to be the case a few weeks back when i began looking at the tree again. If you cut the trunk about 2 inches above the branch which is the new leader you can then wire the new leader up to this. I find this easier. When the new leader is set in place you can then cut the trunk down to the new branch. Because the new leader is growing well the sap flow around the cut should also help it to heal quicker. I think i see, leave one branch then remove said branch/new leader when new one is ready? Really loving that design you've drawn up there, I was going to suggest making a literati myself, but your plan seems better. As for fertiliser I'd recommend Chempak low nitrogen, I find it really good to get bushy growth. 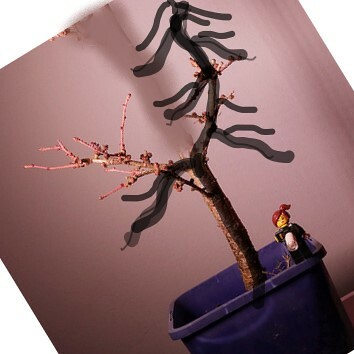 So i performed the trunk chop a week or so ago, i have not repotted it yet, but i do have some containers perfect for air pruning the roots, would this be an advantage for the larch or otherwise? Not used pots in this way before, so im unsure about which species work well in them, or whatever, could any tree be put into a container with holes to prune its roots? I always put my trees in pond baskets when I can we I'm developing them.